If you are working on a computer that does not have the Citrix Receiver or the Citrix Workspace app installed, you can still access IUanyWare virtualized applications via iuanyware.iu.edu. Your computer will use Citrix Receiver for Web, also called Citrix Receiver for HTML5. UITS recommends that you use the full version, rather than using Citrix Receiver for Web; for instructions for using the full version, see Set up and use IUanyWare. All IUanyWare logins require Two-Step Login (Duo), though they do not go through CAS. For IUanyWare status updates, visit status.iu.edu. As of July 27, 2017, you'll see the same interface whether you log in via iuanyware.iu.edu or via storefront.iuanyware.iu.edu. After login, by default, you'll be taken to your FAVORITES tab. You don't need to use the storefront.iuanyware.iu.edu URL except to configure Citrix, which the IUanyWare team does not recommend doing. In your browser, navigate to iuanyware.iu.edu/ and click Log in. On the login screen, enter your IU username and passphrase, and then click Log On. On the Duo screen, complete a Two-Step Login using the Duo option of your choice. For more, see Get started with Two-Step Login (Duo) at IU. On the "Welcome" screen, click Use light version. When the storefront appears, select the DESKTOP or APPS tab. Click the icon of the desktop or app you wish to launch. 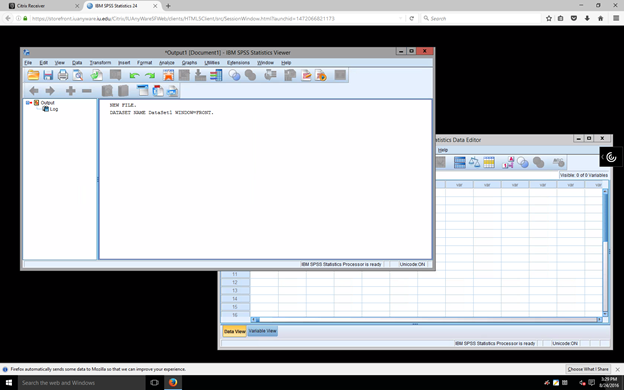 Citrix Receiver for Web has a floating toolbar that you can move to any part of the screen within the application through the browser. To collapse the toolbar, at the top of your browser window, hover over the icon that looks like a half circle with three bars inside it ( ). It will change to an icon that looks like a circle with three white lines inside it that go three quarters of the way around it ( ). Click this icon to expand or collapse the HTML5 toolbar. To move the toolbar, at the top of your browser window, hover over the icon that looks like a half circle with three bars inside it ( ). It will change to an icon that looks like a circle with three white lines inside it that go three quarters of the way around it ( ). Click, hold, and drag this icon to the desired location. To change to full screen view, use your standard shortcut (e.g., press F11). If this doesn't work, from the toolbar, click the circle containing four outward-pointing arrows ( ). You cannot move images or formatted text out of an IUanyWare session. In your IUanyWare session, highlight the text you want to copy. Copy the text using Ctrl-c (command-c on a Mac) or another copy function. Select the clipboard icon ( ). The text you copied will appear in the clipboard, with all formatting stripped. Highlight the text that appears in the clipboard, and use Ctrl-c (command-c on a Mac) or another copy function to copy the text. You'll see a message stating "Copied to device clipboard", which confirms that the text has been copied to your local computer. Paste the unformatted text into the local application of your choice. You cannot move images or formatted text into an IUanyWare session. On your local computer, highlight the text you wish to copy. In the IUanyWare toolbar, select the clipboard icon ( ). Press Ctrl-v (command-v on a Mac) to paste the text into the IUanyWare clipboard. You'll see a message stating "Copied to session clipboard", which confirms that the text has been copied to your IUanyWare session. Paste the text into the IUanyWare application of your choice. Citrix Receiver for Web does not map local drives into your IUanyWare session. UITS recommends that you manage your files through a cloud storage service or file share that is accessible through IUanyWare; for more, see Save your files when using an IUanyWare application. In the toolbar, select the upload icon ( ), which looks like an arrow pointing up into a cloud. On your local computer, select the file you wish to upload and click Open. Select only one file at a time. The upload tool can upload a zipped folder, but will not upload a folder that is not zipped. In the "Upload To:" window, select one of the cloud storage options listed under "Computer", and then click OK.
You will now be able to access your file in your IUanyWare session from the cloud storage option of your choice. You have two options for moving files from your IUanyWare session to your local computer. While the file in your application is open, click Save. In the left panel of the "Save As" dialog box, open the This PC drop-down menu and select Save To My Device. Your file will be saved in the Downloads folder of the browser you are using for your IUanyWare session. In the toolbar, click the download icon ( ), which looks like an arrow pointing down out of a cloud. In the "Open" dialog box, locate and select the file you want to download to your local computer, and then click Open. Your file will be saved in the Downloads folder for the web browser you are using for your IUanyWare session. Citrix Receiver for Web will not inherit the default printer of your local computer. You'll need to choose a printer available in IUanyWare, or save the file to cloud storage or to the local computer so that you may print elsewhere. This is document ammn in the Knowledge Base. Last modified on 2018-11-28 11:53:29.